Relocating to our area or somewhere else? We can help. Whether you are moving across the country or across the world, CENTURY 21® Alliance Realty can also help you find a qualified REALTOR to buy a home. We have helped thousands of clients each year find new homes all over the world. We have assisted military families returning from overseas, corporate executives moving to new career opportunities, and families looking for vacation homes. Relocation is more than simply moving from here to there. 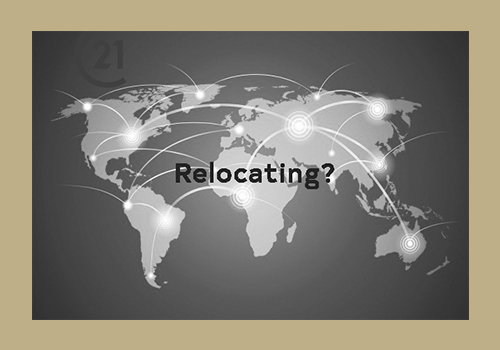 At CENTURY 21® Alliance Realty Relocation implies arrival - settling into work, home, schools and activities in a new community, as smoothly as possible. CENTURY 21® Alliance Realty will select an experienced REALTOR® professional to represent you, full buyer representation by your REALTOR®, help you through the entire process, help you get loan pre-approval, help you to get to know our local area and communities. CENTURY 21® Alliance Realty will connect you with a top real estate professional in your destination area, help you make informed decisions by providing you information on your new area, such as school information, area amenities, communities, and market conditions, help you get loan pre-approval so you’ll be ready to go when you begin your house-hunting, help you coordinate the sale of your current home and the purchase of your new home. CENTURY 21® Alliance Realty offers the ultimate in relocation services and assistance to persons relocating to or from the Hernando County area. We are dedicated to providing you with the help you need to make your move. We understand the relocation process, whether you are being transferred by your employer or making a move on your own. Since its founding in 1979, CENTURY 21® Alliance Realty has assisted individuals and families in their lease, purchase, or sale of real estate. We are locally grown, yet internationally known with over 7,700 offices worldwide. With one phone call 352.686.0000, we will be able to set the relocation process in motion. Buyers and sellers, ask your sales associate for details.